On January 18, more than 200 volunteers from the Atlanta area gathered in the recreation hall of Rock of Ages Lutheran Church in Stone Mountain to pack more than 4,000 pounds of rice for refugees recently resettled by LSG. As they mingled and waited for the rice packing to begin, many volunteers made signs, sharing their reasons for supporting refugees in Georgia and explaining why they choose to spend their day off from work or school as a day of service. In a little over an hour, the hard-working volunteers – who ranged from groups of middle schoolers to individuals and families to groups of adults from local congregations - re-packaged the 25 and 50 pound bags of rice into smaller family-sized bags to be distributed to refugee families. A bag of rice may seem like a strange welcome gift, but to those entering a brand new country with few resources and no immediate means to secure their family’s next meal, rice can be more than just food. Rice, often a central part of the diets of many refugees, can bring a feeling of comfort and security in a tumultuous period of their life. When refugees step off a plane at Hartsfield-Jackson Airport to begin their new life in the United States, they’re often exhausted and overwhelmed from their journey and the long waiting period spent in a refugee camp. They are unsure of what the next hours and days will bring. Lutheran Services of Georgia provides them with food, shelter, clothing, cultural information, and other support in the first weeks in America, setting them up for to be self-sufficient and contributing members of their communities. Lutheran Services of Georgia currently resettles over 600 refugee clients each year in the Atlanta and Savannah areas. 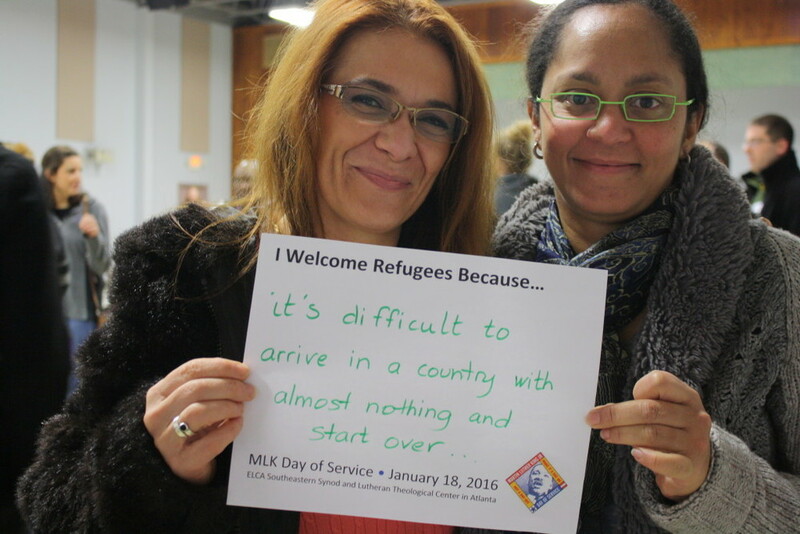 In 2015, LSG resettled refugees from 14 countries: Afghanistan, Bhutan, Burma, Central African Republic, Cuba, Democratic Republic of the Congo, Eritrea, Ethiopia, Iraq, Burundi, Sri Lanka, Somalia, Sudan, Indonesia, Iran, and the Ukraine. LSG is there to secure housing for refugees, help refugees find their first job, and assist refugees in getting acclimated to life in Georgia. LSG supports refugees as they apply for important documents, including social security and Georgia ID cards, enrolls refugee children in school, and helps refugees select a primary care physician. LSG provides cultural orientation covering essential aspects of U.S. culture, including U.S. law, medical and educational systems, transportation, banking, and more. With help from organizations like LSG, more than 80 percent of newly arrived refugees in Georgia became completely self-sufficient within 180 days (source: CRSA). In addition, LSG’s Savannah office provides additional support for refugee children through the Refugee School Impact Program, launched in spring of 2015. This program aims to improve the academic performance and social adjustment of refugee children. LSG’s School Liaison and a team of volunteers support families through tutoring, individualized case management, regular assessments, and meetings with parents, teachers, and school administration. 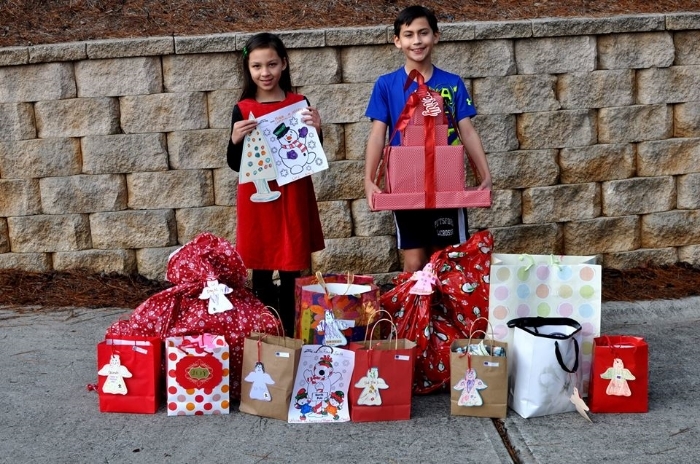 LSG relies on volunteers and donors to help the many families in need in Georgia. "Participating in the MLK Day of Service with LSG was a tangible way for me to put my Christian faith into action. We believe that God's kingdom is a place where all are fed and welcomed. Yesterday I was part of a group working with God for his kingdom right in our midst. For me, there is no greater joy!" Refugee resettlement is only a portion of what we do and who we serve.We help find homes for children through Foster Care and Adoption. We keep families together who at risk of separation through our Family Intervention Services. LSG provides disaster relief when needed. If you are interested in volunteering with Lutheran Service of Georgia, please contact us at 404-875-0201 or click here to get involved. Thank You for Supporting LSG for GA Gives Day! Special thanks to all of you who donated to Lutheran Services of Georgia on November 12th in celebration of Georgia Gives Day. Thanks to YOU, we raised over $6,350 and we were also approved to receive additional matching funding from the SunTrust Financial Wellness Challenge. We appreciate our many donors who joined us in working to help find, strengthen and create homes for those we serve. Thank you! One Week Until GA Gives Day! By making your GA Gives donation at specific times throughout the day, you increase LSG's chances of winning "Power Hour" prizes. Please consider giving during the following hours: 9 a.m. to 10 a.m. 11 a.m. to 12 p.m. 5 p.m. to 6 p.m. There's still time to become a GA Gives fundraiser for us! Go to our Georgia Gives profile and click "Become a Fundraiser" to create your own profile. Use your profile to ask friends and family to support LSG. It's a great way to show how much you love LSG and inspire others to give. If you need help setting up your profile, click here. It's not too early to donate to LSG's Georgia Gives page! Click here to give now. Thank you for supporting LSG! For more information about Georgia Gives Day, contact Allison Hood at ahood@lsga.org or 404-591-7067. You can also contact Allison if you'd like to make an offline donation that day. On July 13, 2015, Lutheran Services of Georgia launched its first-ever season of LSG Kids Club! 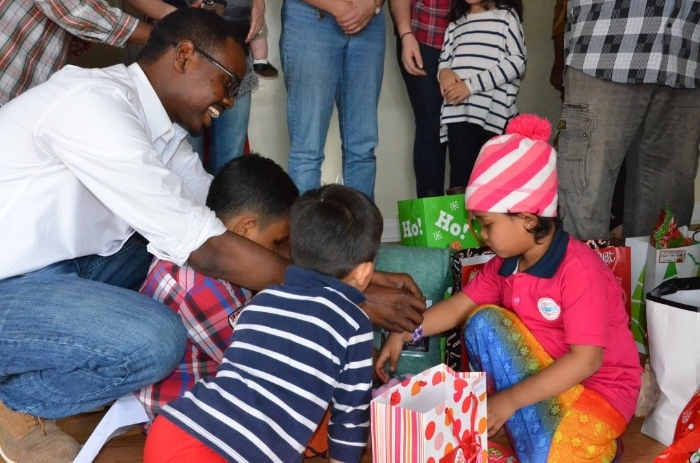 LSG Kids Club is a summer program that aims to promote healing, adjustment, and confidence-building for recently resettled refugee kids who have experienced trauma. The program provides a fun and therapeutic introduction to life in Georgia, along with giving kids an opportunity to make new friends. Eleven children and teens participated in the first week of the four-week LSG Kids Club. They came from four different countries--Somalia, Burma, Bhutan, and Nepal--and spoke three different languages--Somali, Nepalese, and Burmese. The kids enjoyed activities and field trips including yoga, pet therapy, skills-focused games and physical activities, and more. Raksha, Inc, a Georgia-based nonprofit organization for the South Asian community. Special thanks goes to Niekachi Nwogo for conducting therapy sessions throughout the program. LSG also thanks our volunteers and interpreters. LSG Kids Club is supported, in part, through a grant from the Lutheran Services for Children Endowment at the ELCA Foundation. For more photos from the Club, visit our Facebook page. To learn more about LSG Kids Club, contact Coordinator Jessie Burnette at jburnette@lsga.org or (706) 889-3348. Lutheran Services of Georgia is excited to announce the 2015 Champion of LSG's Hunger Walk/Run Church Competition: Trinity Lutheran Church! Trinity raised $11,902 to fight hunger. Thanks to all who joined LSG in fighting hunger at the 2015 Hunger Walk/Run. LSG had 34 teams participate with 289 walkers and runners. Together, LSG supporters raised over $77,000 for hunger-fighting programs throughout Georgia. LSG appreciates all those who walked, ran, volunteer, or otherwise supported us. For more photos from the day, including team photos, please visit our Facebook page. Contact Abi Koning, LSG's Communications and Public Relations Manager, at akoning@lsga.org if you would like a photo emailed to you. LSG is honored to be a beneficiary of the Hunger Walk/Run, a project of the Atlanta Community Food Bank. We appreciate the opportunity to work with them each year on this event. LSG has been a benefiting partner for almost 30 years and we look forward to another great Hunger Walk/Run on March 13, 2016! On Saturday, April 18th, Lutheran Services of Georgia held Expressions for Hope, its 3rd Annual Spring Art Show Fundraiser to benefit children, adults, and families in need in the Savannah area. Attendees gathered at the historic Lutheran Church of the Ascension on Wright Square for an evening of art. Attendees listened to excellent live piano from Cornelia Ewaldsen and Michael Braz while enjoying a range of original works and prints for sale from local artists. This year's artists included Jacqueline Carcagno, Gwen Frazier, Jonathan Keller, Ann Lutz, Tiffani Taylor, Diane Walling, and Michael Wozniak. One attendee who has participated in all three Art Shows commented that the quality of this year's art was especially high. All artists donated a portion of their sales and several donated their entire sales to LSG in Savannah. Wright Square Cafe catered the event and Johnnie Ganem provided the beverages. Both companies were silver sponsors for the event, as was Pace Lighting. LSG thanks our sponsors, our community partner Art Rise Savannah, participating artists, and all those who volunteered their time and resources to make this event a success. LSG Celebrates New Americans at the Capitol! 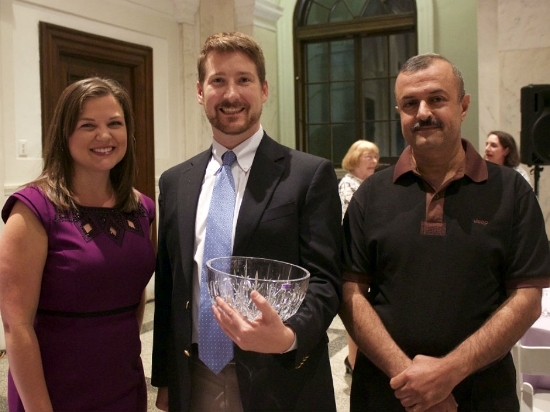 On February 11, 2015, Lutheran Services of Georgia's Refugee and Immigration Services team participated in the New Americans Celebration at the Capitol, organized by the Coalition of Refugee Service Agencies (CRSA). Fifteen LSG staff, interns, and clients attended this exciting annual event, joining representatives from other resettlement agencies throughout Georgia. Our group visited the offices of elected officials to distribute information about refugees in Georgia and the many ways refugees contribute to making Georgia a great state. We used the page system to invite our elected officials to speak with us. Several came out to meet with us, and we were able to introduce them to many of our clients and staff members who have incredible stories to share. In the afternoon, our group participated in a moving Naturalization Ceremony at the Capitol. Students in Clarkston High School's culinary program served appetizers to celebration participants and legislators. Twelve former refugees, including two former LSG clients, took the oath to become American citizens. Both clients were resettled by LSG five years ago, and finally received their U.S. citizenship. The Naturalization Ceremony was a powerful moment for the staff, clients, and elected officials who attended the event. Our clients have been through so much, and it was wonderful to see them take this huge step towards discovering their own American Dream. 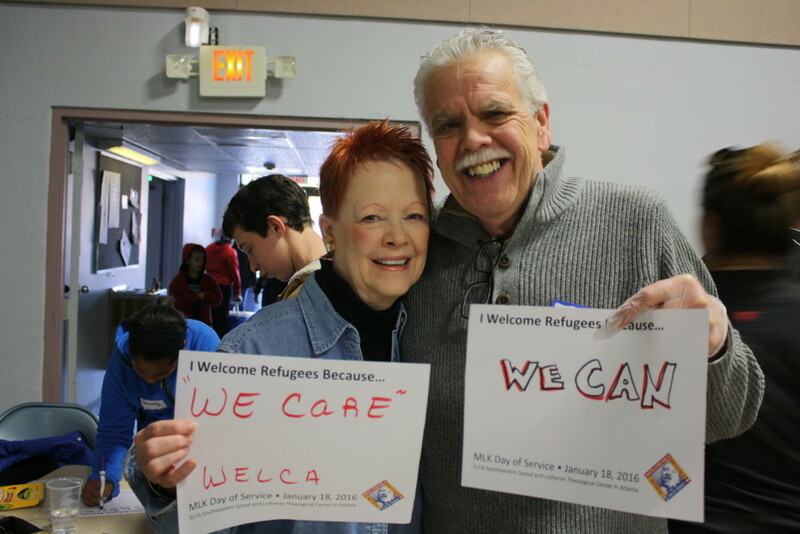 Volunteers Serve Refugees and Immigrants at the 2015 Lutheran MLK Day of Service! Clothing, diapers, strollers, and Pack 'n Plays for 30 refugee families with babies and young children, donated by Helping Mamas. Volunteers packaged rice into family-sized bags of "welcome food" for newly arrived refugee families. Volunteers read books to children in daycare in Clarkston's refuge community. Volunteers sorted children's books to be distributed to children in Clarkston's daycare centers and schools. Volunteers wrote letters of compassionate support to 13 immigrants in detention centers across Georgia. For more photos from the Day of Service, visit our Facebook page. Volunteers also shared their motives for serving immigrants and refugees. Click here to see what they had to say. 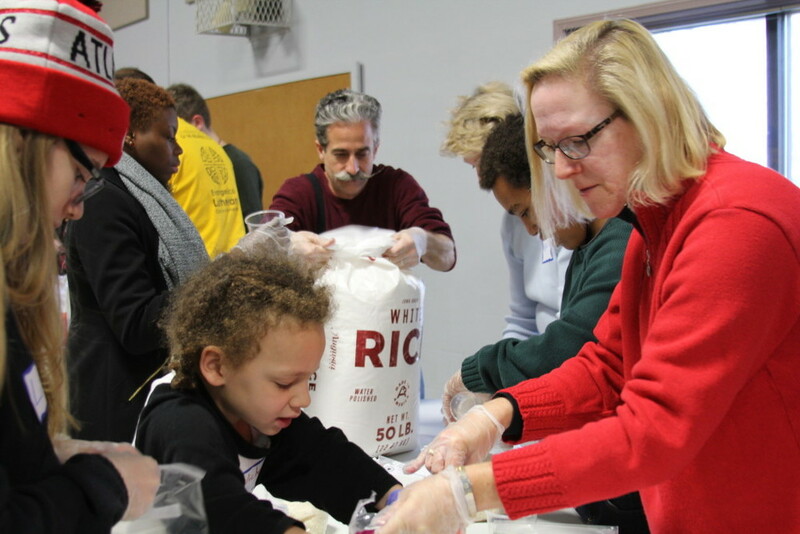 Each year, at the Lutheran MLK Day of Service, individuals, congregations, and community groups come together to serve refugees through service projects, including Rice for Refugees. Have you ever wondered why Lutheran Services of Georgia collects rice? The Rice for Refugees project is one crucial way that LSG welcomes refugee families to the United States. After fleeing persecution, conflict, and other dangerous situations in their home countries, most refugees arrive in the U.S. with little more than the clothes on their backs. LSG provides refugees with food, shelter, clothing, cultural information, and other support during their early days in the United States. Rice is considered a staple food in many countries throughout the world, and is a central part of the diets of many refugees. When you donate rice to LSG, you are quite literally feeding those who might otherwise go hungry. On January 19, 2015, volunteers at the Lutheran MLK Day of Service will donate and pack rice into 5-pound bags to be given to newly arrived refugees. LSG needs lots of rice to ensure that all of our refugees are fed, so please bring as much rice as you are able. Other Lutheran MLK Day of Service volunteer opportunities include sorting new or gently used children's books, reading to refugee children, and writing letters of compassion to immigrant detainees at non-citizen detention centers. LSG will also be accepting donations of new and gently used children's books. Click here to RSVP for any of our service projects. If you are unable to attend the Day of Service, but would still like to donate rice or children's books, donations will be accepted at Rock of Ages Lutheran Church (5135 Memorial Dr., Stone Mountain, GA 30083) from 12 p.m. until 1 p.m. on Friday, January 16 and Sunday, January 18. For more information on donations, or to arrange a drop-off, please contact Melanie Johnson at mjohnson@lsga.org or 678-686-9619. To see photos from last year's Lutheran Day of Service, click here. On Thursday, October 30, 2014, Lutheran Services of Georgia hosted an orientation for individuals interested in opening their homes to unaccompanied migrant children. In response to outreach efforts in LaGrange, several families came out to LaGrange Memorial Library to learn more about becoming short-term, transitional foster homes for this vulnerable population. The evening began with snacks and introductions. Gayle Cruz, LSG’s Specialized Foster Care Recruiter, and Anton Flores, co-founder of LaGrange’s Alterna, presented on short-term foster care. Attendees watched a video explaining the conditions that cause unaccompanied children to flee their countries of origin and the treacherous journeys they make to the United States. Afterwards, LSG gave out packets of information including applications to begin the foster care training process. Five families expressed interest in becoming short-term foster homes, and two families have already taken the first steps to begin training. LSG is collaborating with other LaGrange area organizations and ministries to create safe, welcoming foster homes and a supportive community for unaccompanied children. A local recreational center has offered to provide space for the trainings and for family gatherings once the children have arrived. LSG is grateful to community partners, including the LaGrange Memorial Library, for their support. LSG is currently determining the next location in metro Atlanta and the surrounding areas where foster homes for unaccompanied children will be developed. Prospective foster families must undergo a three-stage approval process involving orientation, training, and a thorough family assessment. The approval process takes three to four months to complete. LSG expects to begin receiving children from the Office of Refugee Resettlement in February 2015. Families with one bilingual adult are preferred, but those without will be considered on a case-by-case basis. If you are interested in learning more about becoming a foster home, contact Gayle Cruz at gcruz@lsga.org or 404-207-0131. Become a Hero of Hope on Georgia Gives Day! 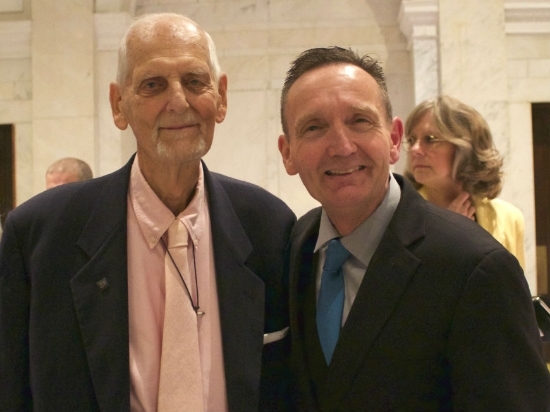 Each year, Lutheran Services of Georgia honors community heroes at the Heroes of Hope, Healing, and Strength Gala. However, we recognize that our communities and churches are full of heroes bringing hope, healing, and strength to people in need every single day. On November 13, continue being a Hero of Hope by giving to LSG on Georgia Gives Day. LSG has set a goal to raise $10,000 on Georgia Gives Day. By giving even a small donation, you help us continue to provide quality services and support. Donations of $10 or more also make LSG eligible to compete for additional funds and awards throughout the day. To give, simply visit our GA Gives profile on November 13, make an online donation, and share our link with your friends and family. Your generosity can inspire them to become Heroes of Hope as well! To thank you for your heroism, all those who donate online on GA Gives Day will receive a special "Hero of Hope" badge for their Facebook profile picture. You'll also receive a brand new story of one of the many clients LSG serves. Click here for more ways you can support LSG on Georgia Gives Day. Thank you for being our Hero of Hope! Win Up to $500 for LSG with an "Unselfie"! Georgia Gives Day is less than a month away on Thursday, November 13! As November 13 draws near, Georgia Gives Day wants to see your stories of why you give...and give you a chance to win up to $500 for nonprofits like Lutheran Services of Georgia. 1) Between now and November 3, take a selfie that shows why you're giving to LSG on Georgia Gives Day. 2) Post it to your Facebook, Twitter, or Instagram and tag it #unselfie and #GAgivesday. Georgia Gives Day will be sharing occasionally from the GA Gives Day Facebook, Twitter, and Instagram accounts. You can also tag your photo with #LSGGives or email it to Abi Koning at akoning@lsga.org and we'll share on the LSG pages. 3) On the week of November 10, GA Gives will share the top finalists on Facebook and count on followers to vote for their favorite with a like. The top three vote-getters will receive a donation to the GA Gives Day nonprofit of their choice in their name--$500 for first place, and $100 each for second and third. And don't forget: On November 13, visit our profile and give what you can. Every donation, no matter how small, supports those in need and helps us compete for GA Gives prizes. For more ways to support LSG on Georgia Gives Day, click here. 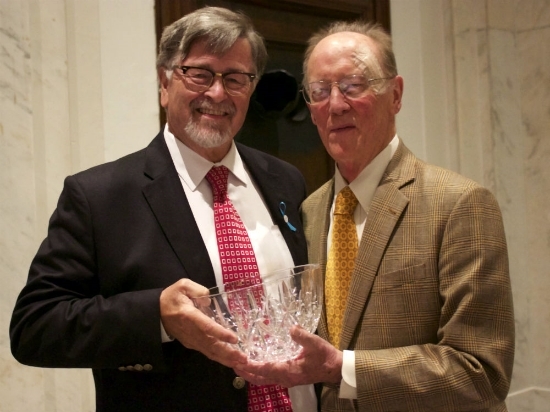 On Thursday, September 25, 2014, Lutheran Services of Georgia honored community heroes at the seventh annual Heroes of Hope, Healing, and Strength Gala. Held at the Defoor Centre, the gala brought together LSG staff, volunteers, and supporters to recognize the Rev. Darrel and Mary Peterson, Mr. Erroll B. Davis, and R.N.C. Industries for bringing hope, healing, and strength to those in need. The evening began with a cocktail reception and silent auction. 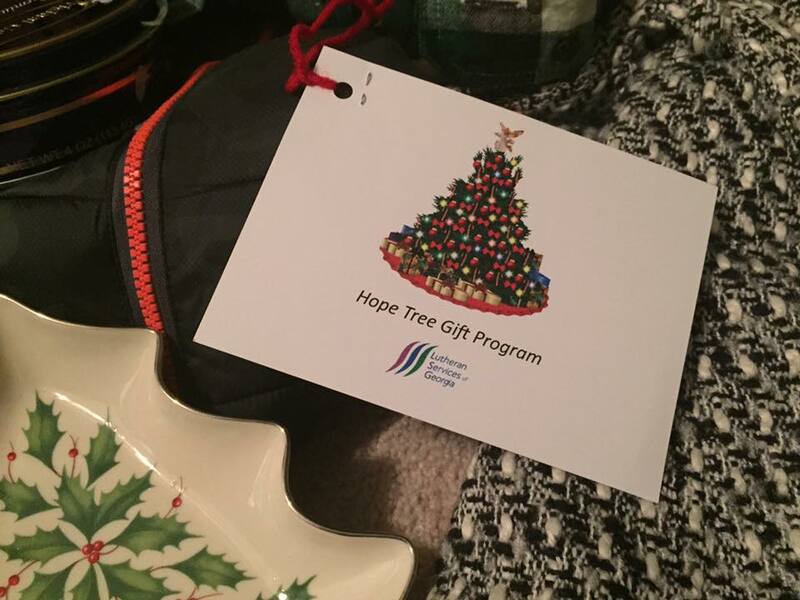 Over 35 individuals, corporations, and organizations generously donated gift cards, handmade scarves, brewery tours, hotel stays, and more for the auction. As attendees mingled and out-bid each other, they enjoyed live music from local jazz musicians, the TAJ trio. Scott Light, news anchor for CBS 46, served as the Master of Ceremonies, expressing his excitement at telling the “underreported stories” of people doing good work in their communities. As attendees enjoyed a three-course meal, LSG staff and clients told stories from Foster Care, Adoptions, and Refugee and Immigration Services. Robert and Geraldine Smith, a couple who has both adopted through LSG and served as foster parents, shared how LSG helped them open their home to children. Jamshid Samadi, a former interpreter for the U.S. military in Afghanistan who arrived in the U.S. on a Special Immigrant Visa, thanked LSG for providing him with employment services. Attendees watched tribute videos about LSG’s 2014 Heroes and the heroes were given the opportunity to speak. Adam and Derek Peterson introduced their parents, the Rev. Darrel and Mary Peterson, praising them for their “intentional lives full of faith, service to others, and most importantly, good times.” Darrel and Mary’s ties run deep with Lutheran Social Services agencies and with the Lutheran church. Darrel and Mary thanked LSG for bridging Lutheran congregations and the community through social ministry to those in need. LSG next recognized Mr. Erroll B. Davis, the former superintendent of Atlanta Public Schools, for his commitment to education and to Georgia’s children. Erroll spoke about his connections with Hmong and Vietnamese refugees resettled in Wisconsin with help from Lutherans. He thanked his wife Elaine for her support throughout their 22 years of marriage. LSG then honored local family-owned business R.N.C. Industries for partnering with LSG to employ recently arrived refugees. Taylor Clark, Vice President of Marketing, and Maria Cornejo, the Human Resources Manager, represented the company. Taylor shared her personal story of watching her family’s business grown and affirmed R.N.C. Industries’ commitment to give their employees a brighter future. LSG thanks all those who made this celebration possible, especially silent auction donors, supporters, the Defoor Centre, Scott Light, and our 2014 Heroes of Hope. We look forward to 2015, when we will celebrate other community heroes who bring hope, healing, and strength to those in need. For photos from the event, visit our Facebook page. To watch the tribute videos, check out our YouTube channel.